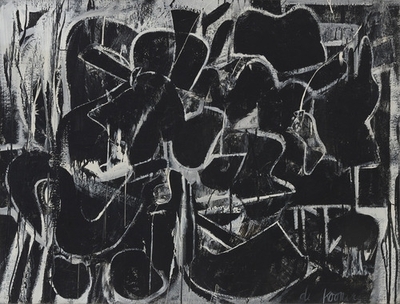 Drawn entirely from the Museum’s vast holdings, Abstract Expressionist New York underscores the achievements of a generation that catapulted New York City to the center of the international art world during the 1950s, and left as its legacy some of the twentieth century’s greatest masterpieces. Galleries on the fourth floor present Abstract Expressionist paintings, sculptures, prints, drawings, photographs, films, and archival materials in a display subtitled The Big Picture, marking the first time in the history of the new Museum building that a full floor has been devoted to a single theme. Jed Perl, a significant contributor to Modern Painters ( Monet, Derain, Poussin), isn't impressed with the curation and hang. He obviously admires the work, which he no doubt knows intimately, but feels the exhibition doesn't reflect the nature of the school or the city being presented. Here is his article in The New Republic. First off there Wasn't a school. They didn't study together and people really need to stop lumping all these wonderful painters together in one school. As Rosenberg said..."Bad painters can be produced by a phrase but a good painter is never identical with any definition." Let's all try to move beyond these 1950's notions of lumping painters together into schools and groups and let them be what they are. And BTW the show was hung beautifully. Especially the Rothko and Newman rooms. It was weird seeing the Klines put in the same rom with Still, but alas, the museum doesn't have enough holdings of either painter, so they don't get their own rooms.